Shrimp & Eggs: Odd Couple or Super Couple? Eggs and bacon seem a natural combination. Same goes with eggs and ham. But, eggs and shrimp? Not so much. Well, maybe "shrimp and grits" with a poached egg perched on top. But just shrimp and eggs? Apparently, though, shrimp and eggs are a thing. A really delicious thing. 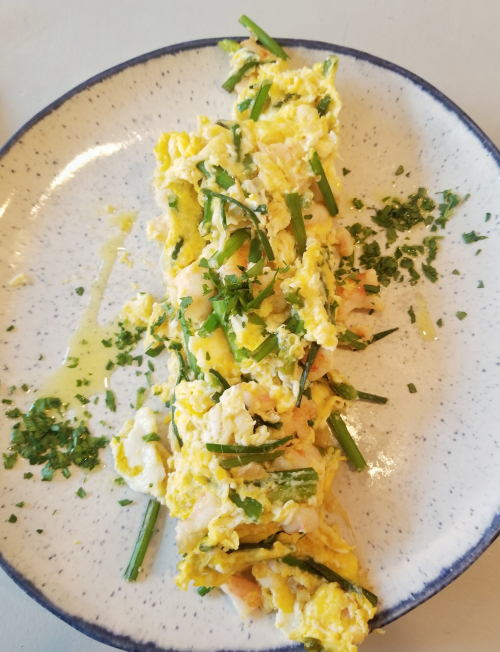 I first encountered their coupling in Manhattan's Chinatown at Wu's Wonton King with a Chinese take that combines soft scrambled eggs with succulent baby shrimp. 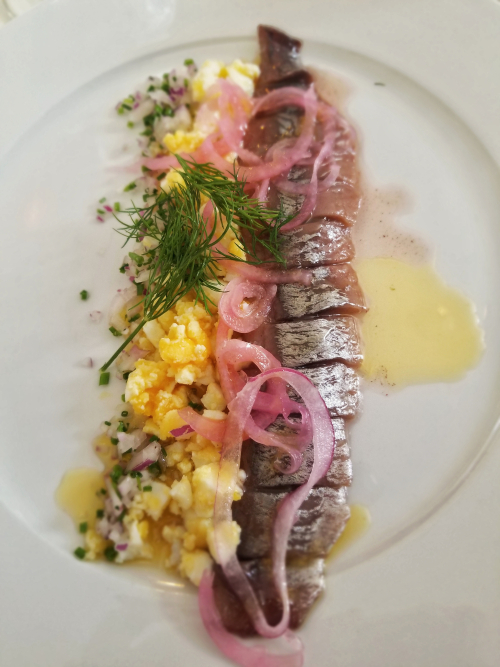 Then, I ran into the twosome over brunch at Brooklyn's Spanish hot spot La Vara. Pictured above, this dish of Revuletos de Gambas con Ajetas was a showstopper. 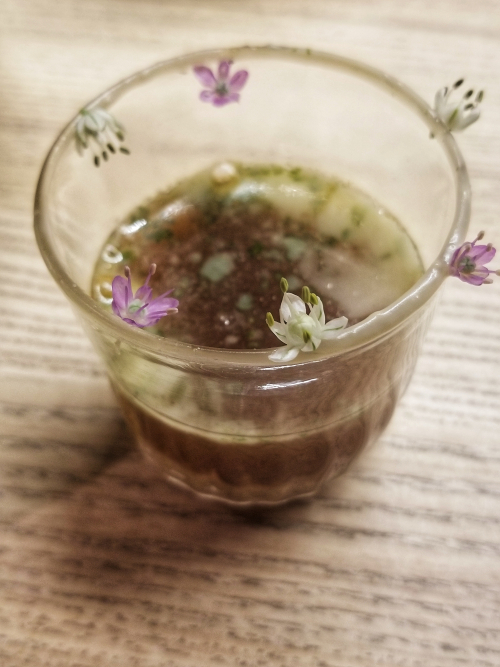 Eggs with chunks of shrimp and a shower of flowering chives. Clearly, I need to introduce this couple to my kitchen at home. Question is whether or not I go Asian or European. It is the day for turkey, cranberries, and stuffing. But, I'm here to talk anything but turkey. I'm here to talk about my trip to Prado. 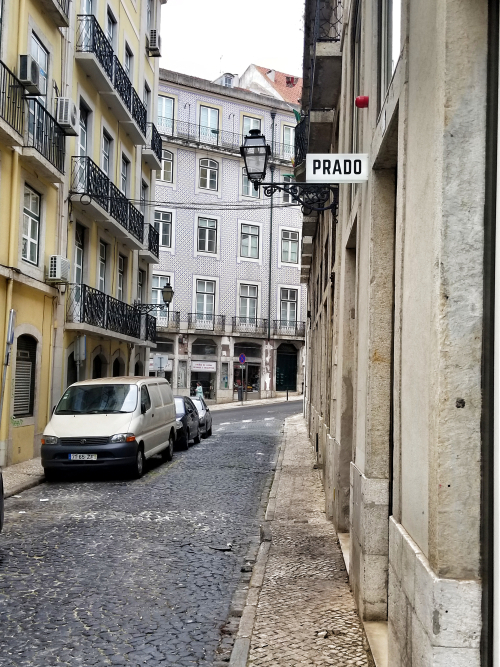 Not "the Prado" in Madrid - Prado, a gorgeous restaurant in Lisbon's Baixa district that offered up art of another sort, the culinary sort. whipped Iberico pork fat, topped with toasted garlic and crushed bay leaf. Who could imagine that this sort of decadence could be topped by a plate of humble mushrooms? No need for a humblebrag here. 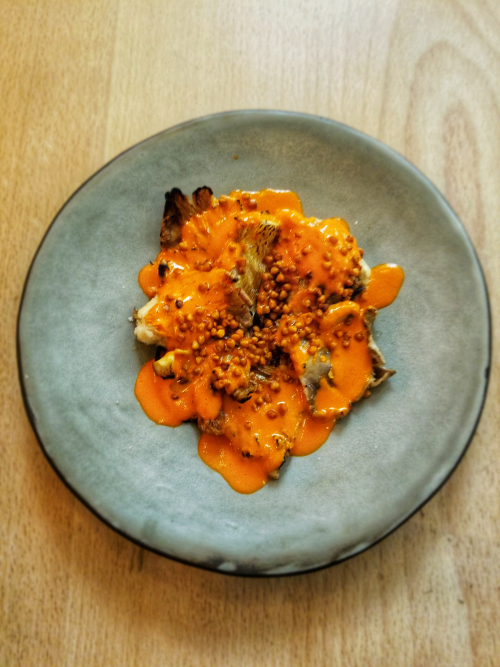 Bathed in a smoked pepper sauce and graced with a handful of toasted barley, this dish was rich, bright, soft, and crunchy all at once. 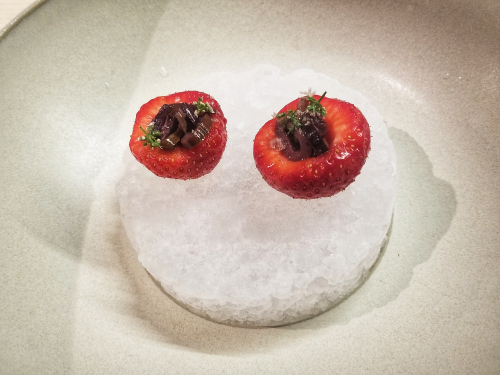 Believe it or not, this is a bowl of smoked milk ice cream. That's right. Smoked milk. It is drizzled with fig leaf oil. 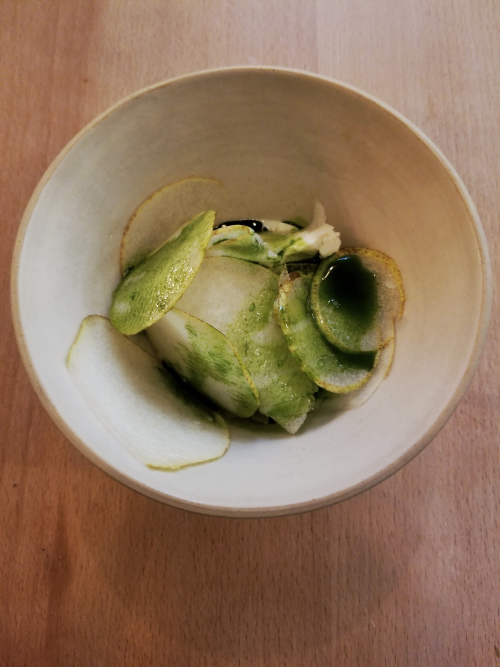 A few paper-thin slivers of pear adorned the bowl as well. I know I have said that I don't care for precious food, but this isn't precious cooking. The photos and descriptors might make you think it belongs in that category, but I say "no." Everything tastes better on a stick. At least that's what the internet would have you believe. Well, one trip to Nargis in Park Slope and I became a believer. 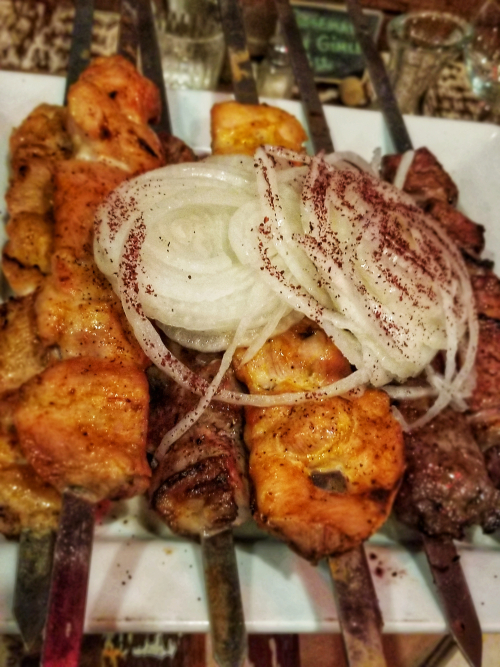 This skewer-centric hot spot served up meat aplenty -- a seemingly endless supply of meaty kebabs topped with slender rings of white onion. The kebab is to Uzbek cuisine what yakitori is to Japanese fare: awesome meat conveyed on a stick. But when it comes to Uzbek kebab think lamb instead of chicken. Mind you, the standard white meat chicken kebab was offered, but so was a skewer of chicken hearts, and so was minced lulya, and so was veal liver. I could get used to men bringing me meat on sticks. It reminds me a bit of a long ago trip to a Brazilian-style rodizio. And, word from across the pond is that sticks are the new bowls. So, expect me to head home soon, toss out my bowls and gather up some sticks for my next dinner party. Or maybe I'll just invite my guests to meet (meat) me at Nargis. 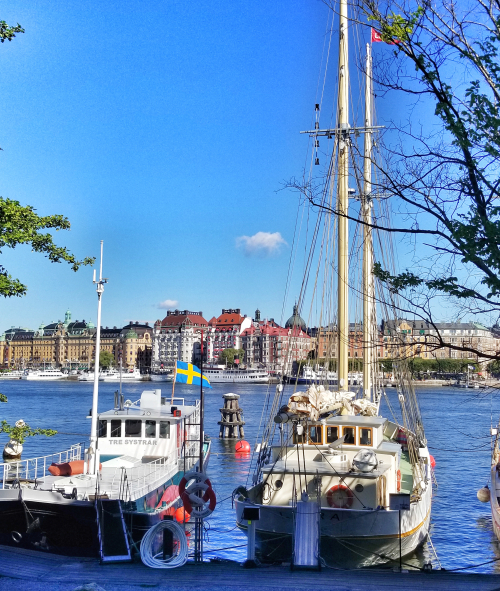 The weather in Stockholm was temperate. Blue skies. Blue lake waters. Breezes. Low 70s. In other words - perfect. That's right. 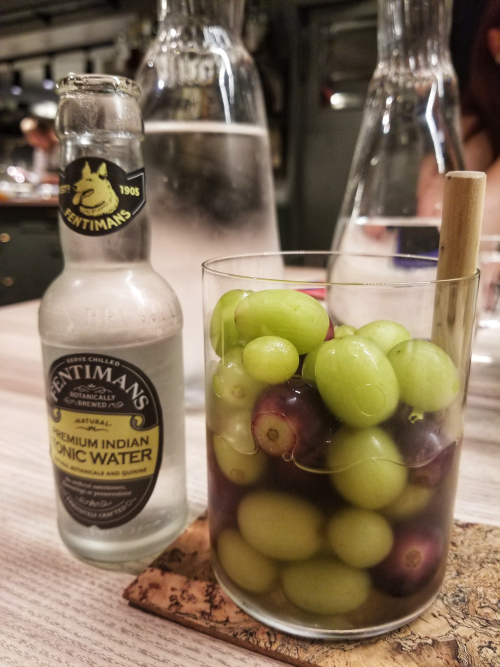 Frozen grapes instead of ice cubes. Genius! 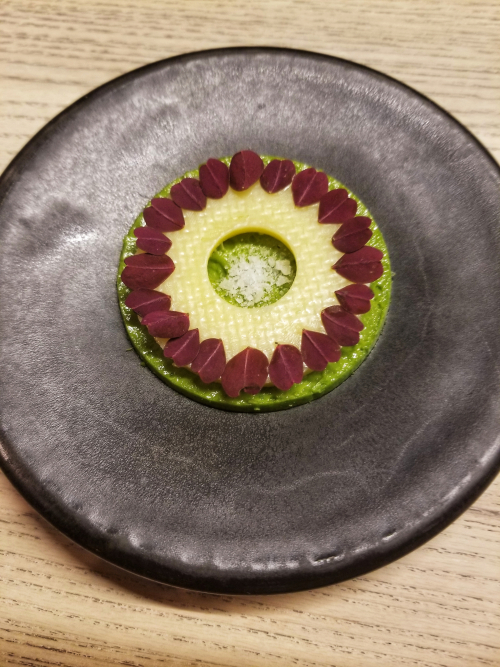 Um, that's butter whipped with garlicky Ramson leaves, topped with sea salt and Oxalis. This was a wow. Heaven. I make great Chicken Soup, but nothing like this. It was an umami bomb. Just a couple sips and it was gone. But damn that was delicious! Hmmmm. Not sure I would try it at home. Still, I liked the way that its sweet and briny sides played with my tastebuds. 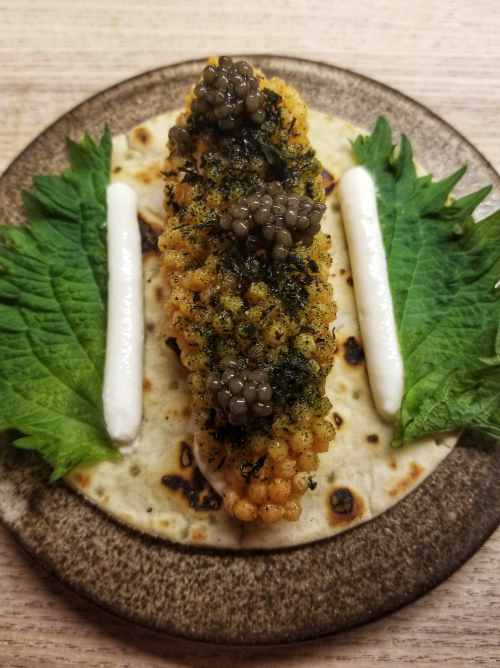 A Langoustine Taco - the shrimp flash fried in puffed rice balls, topped with caviar, and accompanied by shiso leaves and creme fraiche. Lush and bright all at once. Beautiful! 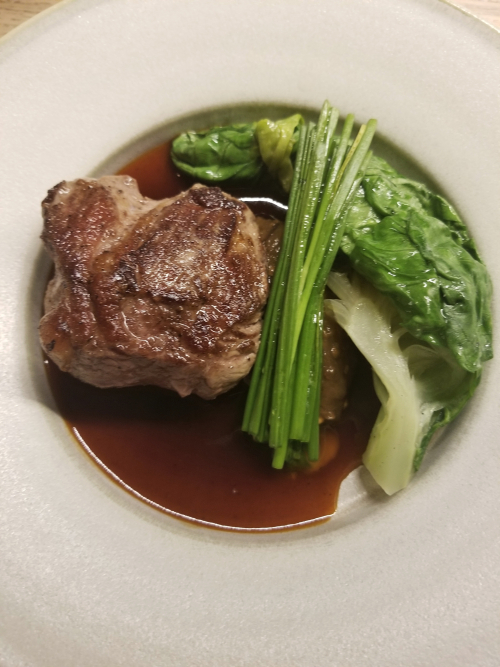 Lamb with Greens. Simple. Gorgeous. Was I all wow-ed out? 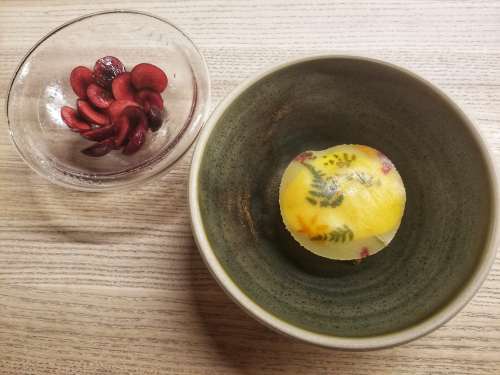 Saffron Panna Cotta topped with herbs and flowers, served with fresh cherries. Warm Madeleines alongside Corn and Chocolate Caramel for dipping. Yeah. This was perfect. Amazing. I arrived in Berlin and was met by a heatwave. 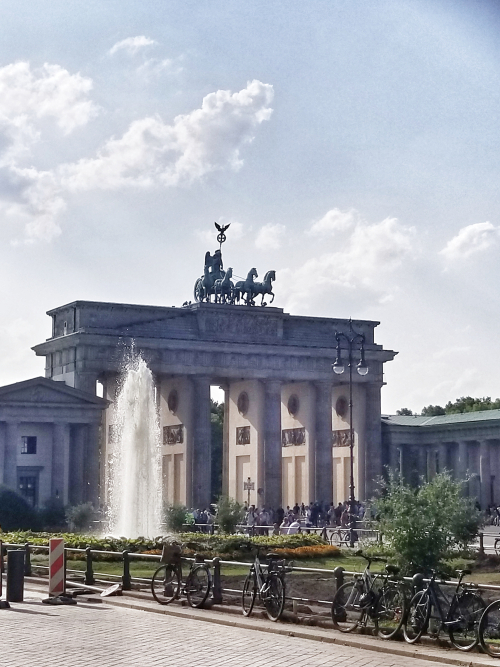 Typically, the average August high in Berlin is 74 degrees. Typical was not happening. It was hot. Very hot. 99 degrees hot and humid. Oh, and did I mention that most hotels, stores, restaurants, and homes do not have A/C? Needless to say I was very uncomfortable. Sweat was my constant companion. Yet, even in my overheated, perspiring state, I was keeping the foodie flame alive. First stop, BRLO Brwhouse, a massive craft beer haunt in the middle of a drab railroad hub and warehouse district. The biergarten was packed with hipsters aplenty. Maybe. Maybe not. All I knew was I was ordering beer. I was ordering some smoked meat. I was ordering some vegetables. I left, still glistening, but pretty sure that Berlin and Brooklyn had a lot in common. 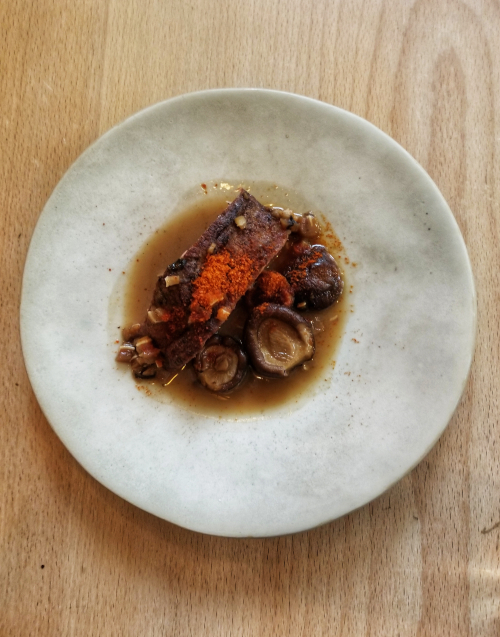 The next day I met up with the man behind Berlin Food Stories, Per Meuling, to get an insider's POV on the food scene. 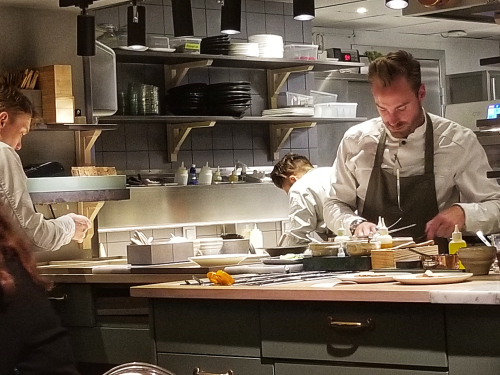 We met at a hip fashion store-slash-cafe at the base of Berlin's Soho House, where I passed by an all-too-familiar branch of Cecconi's at the other side of the club's entrance. 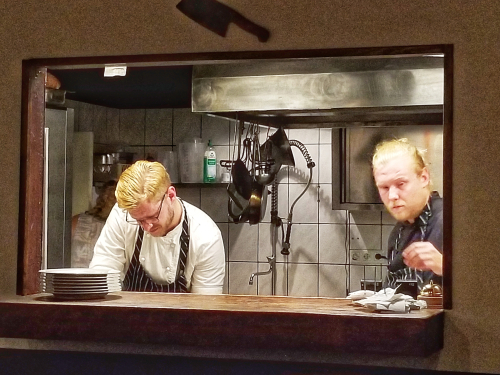 Per gave me a glimpse into the restaurant landscape in Berlin - and warned me about the dicey "mystery meat" that was to be had in the ubiquitous Doner Kebab sandwiches offered around town. OK. Mystery meat was off-the-table. But what about cooling off that afternoon? 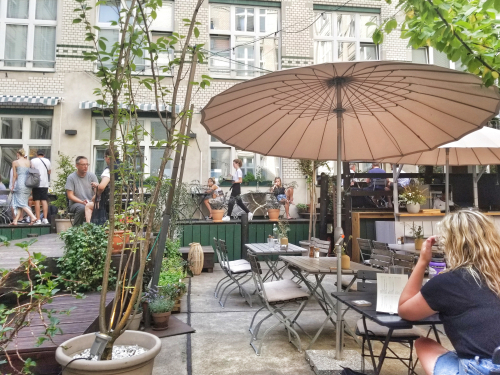 He was clear in his direction - go to the Michelberger Hotel, go to their restaurant courtyard, find the shadiest spot available, take a seat, and drink copious amounts of coconut water. As a light breeze brushed against the courtyard, and I sipped on refreshing coconut water (followed by a chilled glass of Reisling), I quickly discovered that "Per knows best." The challenge? Open kitchen. Oven heat-meets-90 degree-even-at-night heat. Unfortunately, I was a bit of a sweat bomb sitting at the bar. But, oh, the food was truly delectable - from the Cooked-Under-a-Brick Roasted Chicken with Lemon and Capers to the Broccolini with Greek Yogurt and Lentils. No photos, due to dark lighting and my attempt to eat speedily in order to return to the fan in my hotel room. 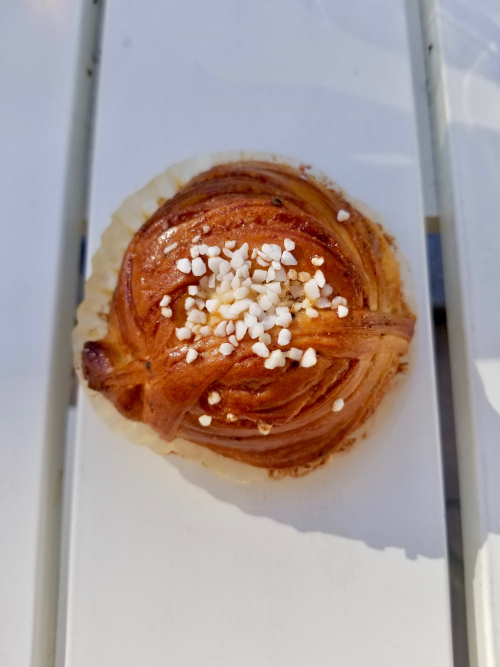 The next day I braved a trip to Markthalle Neun for Street Food Thursday and was immediately struck by its likeness to Smorgasburg. And, then I met some newfound friends for dinner at one of the city's many Vietnamese eateries, sitting outside under the restaurant's awning in the hope that a light wind might arrive. It arrived all right. In short order it became a fairly strong wind. Then it became a fierce wind - bringing with it the crack of thunder and a flash of lightning - and then a downpour. And, after the storm was over, so was the heatwave. We agreed to revel some more the next evening - and I suggested the Michelberger courtyard for the occasion. 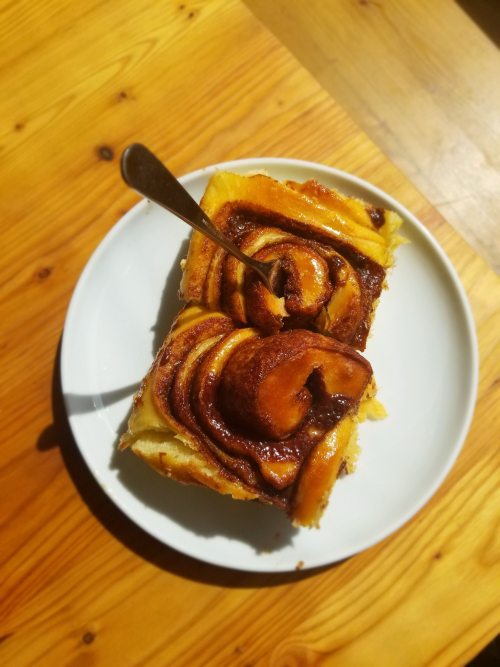 This Cinnamon Roll was no Cinnabon. And, it didn't remind me of Brooklyn baked goods. It was something unto itself. It was a chocolate wonderland located on Gendarmenmarkt. Grand and yet playful, it was unlike any confectioner I had visited in the County of Kings. 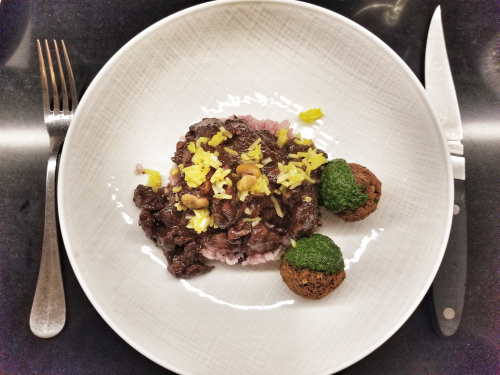 Now, dinner at Michelberger did put me in prime Berlin hipster zone - and with dishes like Burrata, Peach, and Pumpkin Seeds, I could imagine myself in Greenpoint or Carroll Gardens - but a small plate of Fried Deer Tongue, Namjim, and Peanuts took me to Bangkok by way of Berlin. Where the heck was I???? Hard to be confused about where you are when you sit down at Zur Haxe and your waiter comes over in lederhosen. 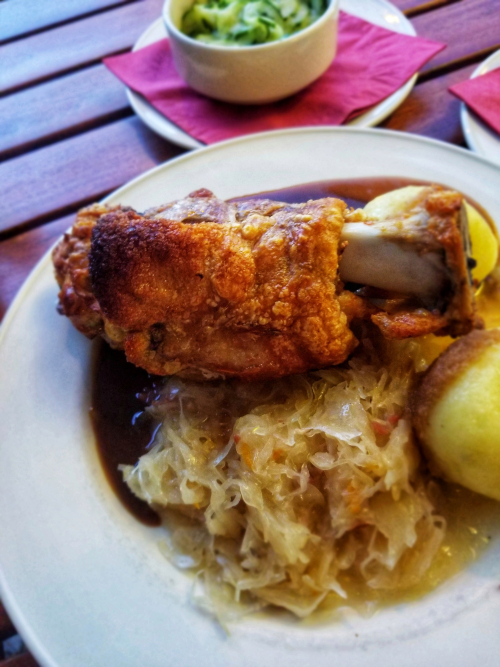 Roasted Pork Knuckle with Sauerkraut and Bread Dumplings with a side of Cucumber Salad and a dark beer to wash it all down? Das ist gut essen! 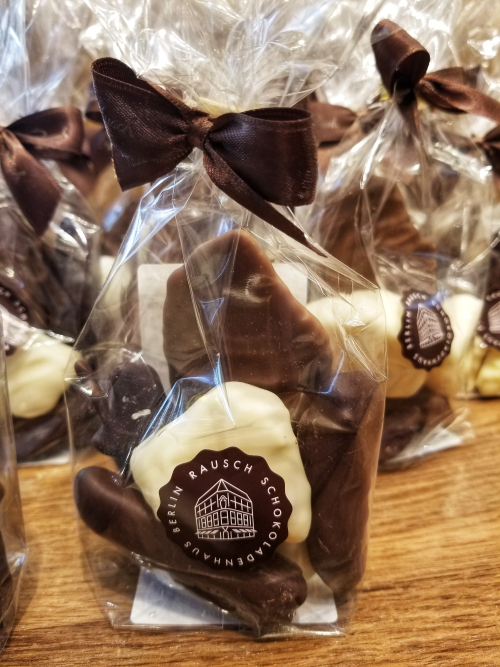 Bayerisches essen! And, with that: Ich bin ein Berliner! Bread is my downfall. 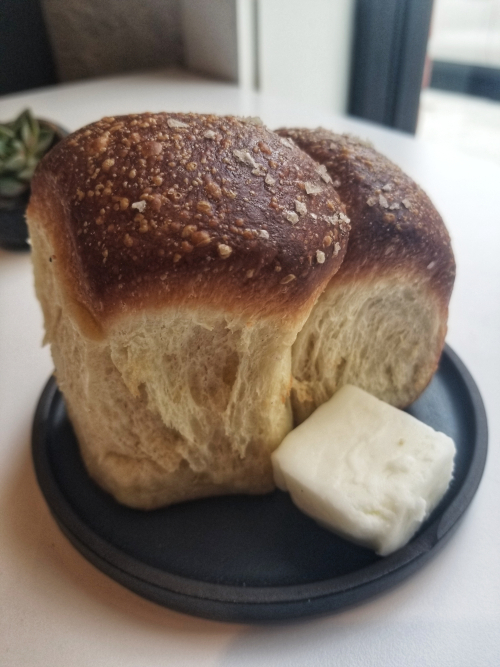 I once found Satan in a bread basket, so why shouldn't I hear the tempting strains of Sirens calling out to me, when presented with warm Parker House rolls at a new LIC hot spot? Sing on, you starchy Sirens! Parker House rolls have been "on trend" for quite some time now. 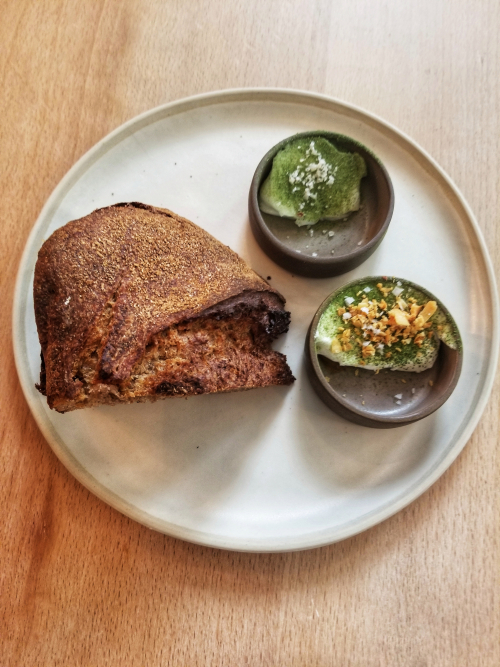 And, well before hitting LIC's Bellwether last night (home to the Parker House rolls pictured above), I have inordinately fond memories of slathering butter on piping hot Parker House rolls at Chef Tom Colicchio's now-defunct Craft Steak, and then his Colicchio & Sons in the same location shortly thereafter. I have yet to bake up a tray of these browned, puffy, delights in my own kitchen. I imagine sprinkling Maldon sea salt atop before thrusting the dough in the oven, waiting breathlessly for the "ding" of timer to release them from the constraints of my stove - and then enjoying them with unrestrained glee. Sing no more Sirens! My hips cannot handle it! Parker House no more!!! Yeah, maybe I have a bread problem. I had no idea that a Refugee Food Festival existed, let alone that it had started in Paris and expanded into restaurant kitchens across 15 cities the world over. It's an impressive endeavor, designed to change perceptions about refugees and find common ground - all through sharing food at the table. Food has a power all its own. A meal made with love and talent can bring people together in a way that nothing else can. Think Babette's Feast. But, this wasn't about Blinis Demidoff or Cailles en Sarcophage. 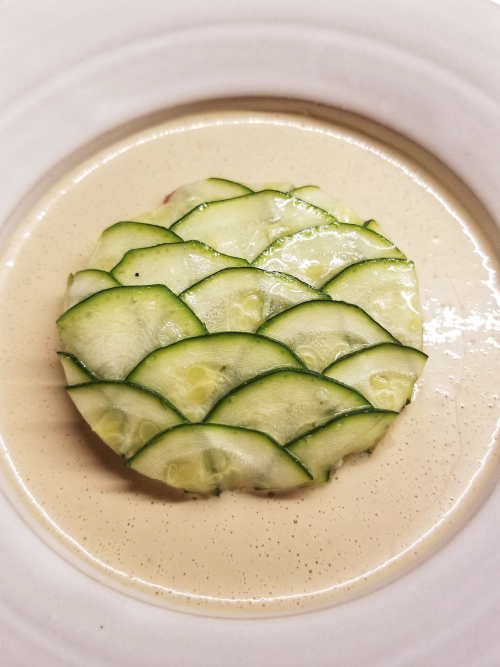 The setting may have been very French - Gramercy's Le Coq Rico - but the dinner was pure Persia. 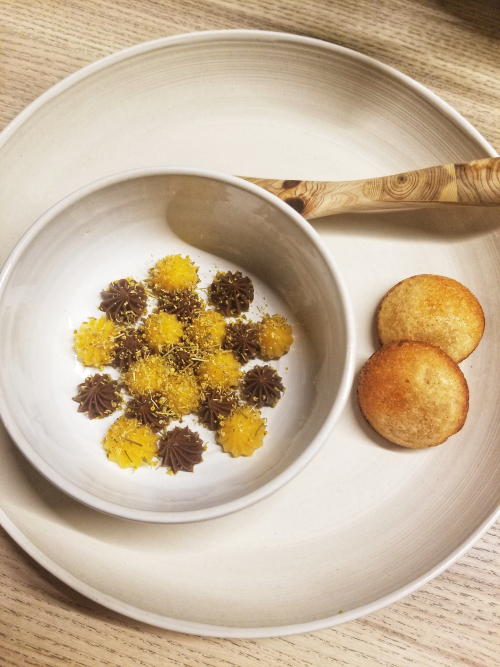 This past Saturday night, Chef Nasrin (who only goes by her first name to protect family still in Iran), served up a mesmerizing menu filled with saffron, mint, and pomegranate - food that excited the senses and satisfied the soul. ...a pomegranate and chicken stew called Fesenjoon, served atop sour cherry rice. Sweet and sour, rich and bright, it was unlike anything else I've ever eaten. A couple Iranian falafel also graced the plate with a vivid green chutney, just in case you needed the combo of crunch and cilantro to serve as a palate cleanser. When the chef emerged from the kitchen, I couldn't congratulate her enough. I wasn't alone in doing so. Diners flocked to her side to compliment the meal and recognize her gifts. While I know proceeds from the dinner are going to help causes that fight for refugee rights in this country, I can't help but think that one weekend of festival events is not nearly enough. Refugees fill restaurant kitchens in New York and all over the U.S., feeding us all year round. They need to know that they are home. We need to find a way to welcome them, their cultures, their cuisines, their families, their hopes and dreams. The American melting pot will be all the better for it. I took Mama Vamp to Austin and she joined me in eating some mighty fine BBQ. 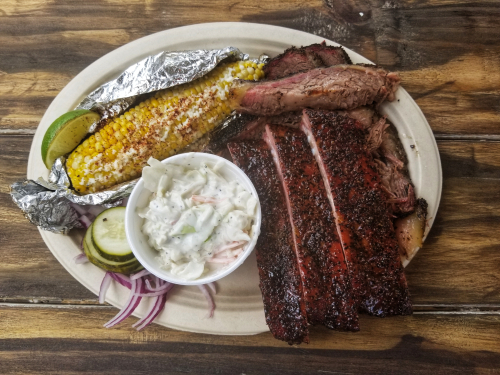 We're talking Freedmen's for some serious smoked turkey and ribs, and a killer G&T. We followed that up with a Mother's Day brunch stop at Kerlin BBQ for the decked out plate pictured above. See that brisket? See those pork ribs? How about that sweet ear of corn? And, now Hill Country is buzzing about opening up an Austin-style food hall in downtown Brooklyn, with - what else? - BBQ. Breakfast tacos will be thrown in for good measure. Will Mama Vamp be in tow? A Sandwich That Has You At "Hola"
It is Cinco de Mayo, so food sites, Facebook pages, and Twitter feeds are filled with talk of tacos and burritos, as well as tequila and mezcal. Now, I am most definitely a fan of a fine taco, as attested to recently on this blog. I also adore a well-made tamale. But, there is a Mexican foodstuff that rarely gets the attention it deserves - and that is the one-and-only cemita. The cemita is a "torta" - better known by Gringos as a "sandwich" - that originally hails from the Puebla region of Mexico. It is a killer, layered beauty. The specimen pictured above was most definitely a masterful example. It was from one of Durham's most beloved taco shacks, La Vaquita. 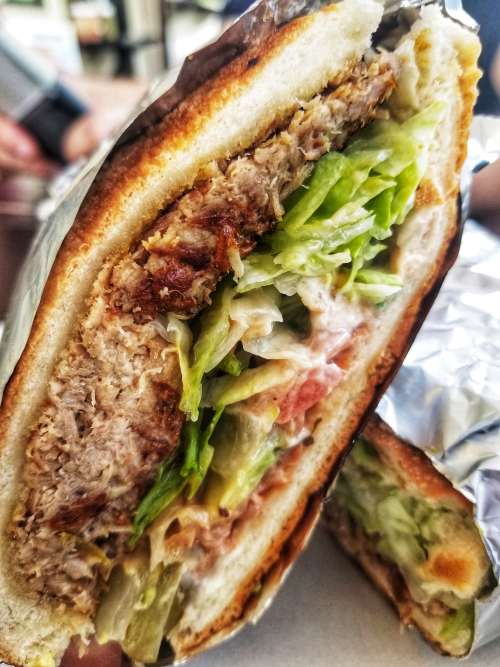 Juicy roasted pork (aka carnitas) was piled high on a toasted sesame roll, accompanied by a slathering of fried beans, a glossing of ketchup, mayonnaise, sliced onions, lettuce, pickled jalapenos, avocados, and tomatoes. It was messy. It was massive. It was love. Similar beasts are available in Brooklyn at various outposts in Sunset Park. My favorite? La Flor Bakery. Haven't been there in ages, but after being enraptured by that carnitas cemita in North Carolina, I think a visit to Sunset Park's Little Latin America is most certainly in the offing. I had a hard time thinking this spot was going to be a big win. A weird little taco joint in Philadelphia's Italian Market that opens a the ungodly hour of 6am to accommodate workers getting off the night shift? My friend John insisted we go and go early - and John usually is right in these things. At first glance, El Compadre seems more than a bit makeshift. Ice cold agua frescas are poured outside the door, as customers line up to order tacos and tortas. As soon as you get past the doorframe you are asked to order from whatever hunks of meat the kitchen has on hand. Accompaniments? Find them on a tiny table to the right. Pile on whatever suits you. Doesn't sound like the makings of a gourmand fantasy - right? The hunks of meat in question are glorious. Simply remarkable. In particular, the barbacoa, meltingly tender lamb, is a stand-out. And, the tortillas for the tacos? Handmade in the kitchen from masa ground from local Lancaster County corn. Warm, they emit the nose-tickling aroma of fresh corn on the cob. Toppings range from marinated nopale leaves and bright green cilantro to chopped white onion and housemade guacamole. These were unquestionably the best tacos of my life. Seriously. Best. Tacos. Of. My. Life. And, El Compadre's presence in the Italian Market isn't a Mexican oddity among a sea of pasta stores and pastry shops on the strip. Slowly, but surely, the Italian Market has welcomed a new set of immigrants, becoming home to Mexican butchers and tortilla makers too. As a result, there seems to be a South of the Border vibe in the land of Rocky Balboa and cheesesteaks. 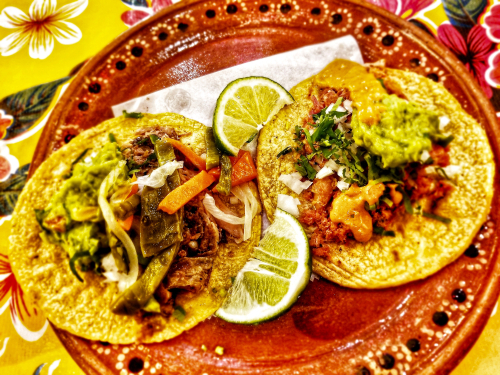 And, if El Compadre's tacos are an indication of what Philadelphia has to look forward to by way of Mexican fare, I think we can confidently say - Viva La Ciudad de Amor Fraternal! 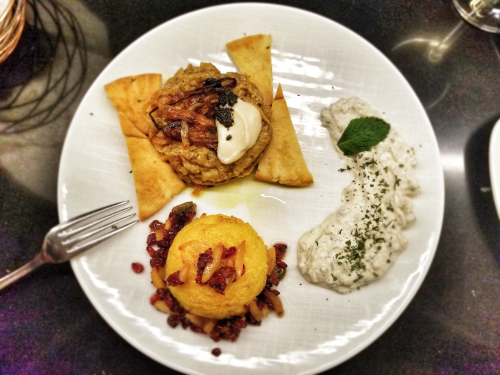 Eating Eastern Mediterranean or Middle Eastern?